There has been a lot of speculation surrounding the wide receiver situation for the Ducks this offseason. The return of Bralon Addison, along with promising 2014 seasons from numerous receivers has left many fans questioning the current status of this position. Devon Allen shows off his speed. Let’s be a little more specific and talk about the slot receiver position, though. Slot receiver’s should be fast off the line, sharp with their cuts, and block in some key situations, especially when running a spread-style offense. We’ve seen a few players take on this role in 2014, more specifically Devon Allen, Darren Carrington, and Byron Marshall. Who could we expect to see in 2015? 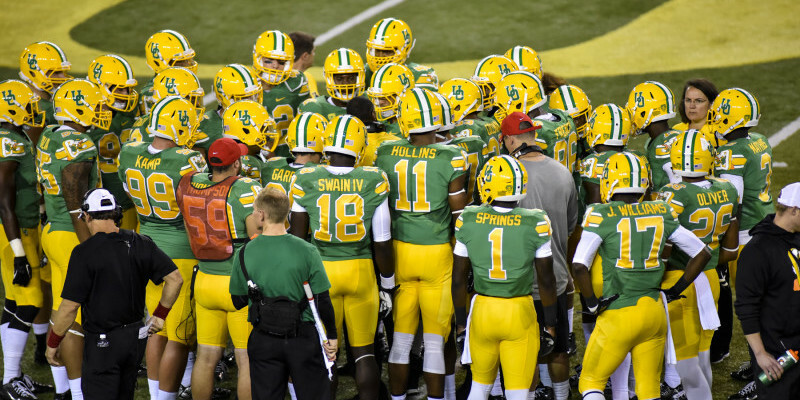 Allen is and always will be a speedster for the Ducks, and Marshall has gained experience both during the season last year, and throughout spring this year. We could even expect to see Carrington run a few routes out of the slot as well. 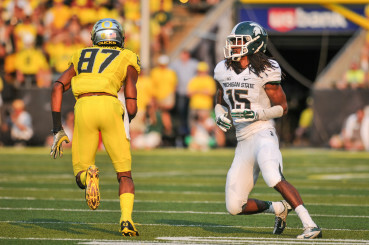 However, with the Ducks’ dynamic offense, we could definitely see many different receivers play out of this position. The pending question is, who will be holding the main slot role when the 2015 season arrives? Carrington beats a Michigan State corner off the line. Currently, the cards are with Allen to be one of the front runners if he is able to rehab well enough in the coming months. In 2014 he had 41 receptions for 684 yards. He was also able to put up 7 touchdowns. Allen also has decent size standing at 6-foot-1 and weighing 185 lbs, though his speed has also been an integral part of his game. As a young player he was able to step up and show what he was about, making him a solid choice for this position. The next candidate who will have a good chance to step into this role is Carrington. He has a size advantage over Allen, standing at 6-foot-2 and weighing 191 lbs. This could be crucial for the run block, especially after Allen received criticism for being “soft” in 2014. Carrington also proved he has the skill for this position, putting up 37 receptions good for 704 yards. 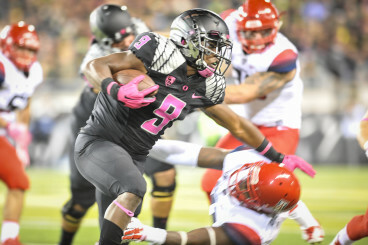 Byron Marshall stiff arms an Arizona player. Marshall is the final candidate to be mentioned for this role. The 5-foot-10, 210 lb. back showed how dynamic he was in 2014. His build is ideal for this role, and with him being in motion a lot of the time truly helps his case. He raked in 74 receptions while amassing 1,003 yards in his first year actually playing as a receiver, which is quite impressive. His improvement in the offseason should also help his case, along with being a senior and is expected to be a leader on the offense side of the ball in 2015. All in all, it will be a tight race for the slot receiver for 2015. We could very well see all of these players taking their turns running out of the slot. That is exactly what will make this Duck offense a fun and fascinating one to watch. Their dynamic athletic ability will keep defenses on their toes, without knowing what hit them.